Damping off disease in lavender and begonias. A fungal disease of emerging seedlings where tiny plants fall over as if severed at the ground line. Avoid by using living organic (not sterilized) potting soil and by placing rock phosphate on the surface of planting media. Treat the soil with cornmeal and spray with BioWash (to clean plants). This disease is caused by a number of fungi, mainly Pythium, Rhizoctonia and Phytophthora. The symptoms include decay of seeds prior to germination rot of seedlings before emergence from the root medium and development of stem rot at the soil line after emergence. 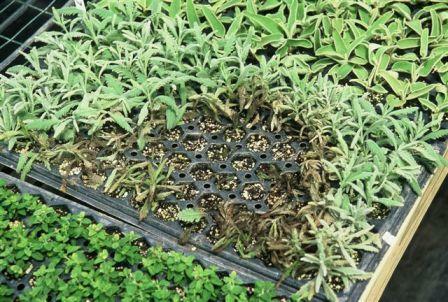 The collapse of seedlings at or just below soil level is very common in synthetic programs where unhealthy potting soil is used. It is especially bad when there is overwatering and/or poor drainage. 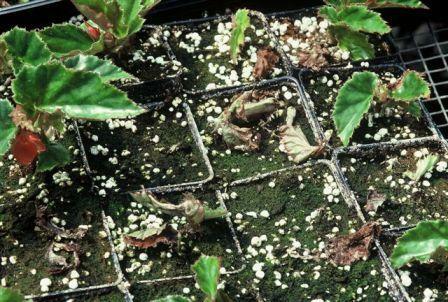 Avoid this disease by using colloidal phosphate or cornmeal on the surface of planting media. Keep soil moist, but not waterlogged. Provide good air movement and always use living organic material such as earthworm castings or compost in the seedbeds. Wait until soil is warm enough for the specific plant before seeding.